A former Aboyne Academy pupil and video designer has been nominated for a Tony Award for his work on an acclaimed play. Finn Ross has been nominated for the accolade for his video projection for the National Theatre’s hugely-successful production of The Curious Incident of the Dog in the Night-time. I’m stunned, thrilled, amazed and honoured to be nominated. The play, which has already won an amazing seven Olivier Awards and is simultaneously running in the West End and Broadway, has been nominated for six Tony Awards in New York. The show will tour to His Majesty’s Theatre in Aberdeen this September. The award winners will be announced on Sunday, June 7. Aberdeen-born Finn has also been nominated for the American Drama Desk Award for Outstanding Projection Design, to be awarded on Sunday, May 31. The video and projection designer is a former pupil of Aboyne Academy and a graduate of the Central School for Speech and Drama in London. He specialises in integrating live and pre-recorded images, animations, and such like into a live performance environment. The UK production of Simon Stephens’ adaptation of Mark Haddon’s best-selling novel, The Curious Incident of the Dog in the Night-Time received a total of seven Olivier Awards in 2013, which included Best New Play, Best Director, Best Lighting Design and Best Sound Design. 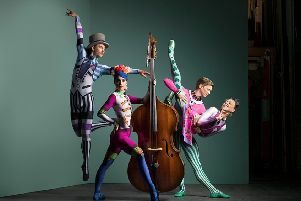 Tickets for the Aberdeen performances, which run from September 1-5, are available online at www.aberdeenperformingarts.com or by phone at 01224 641122.